The drive from Keene Valley to Saranac Lake in the winter shows why the Adirondacks are the leading winter sports capital of the Eastern United States. 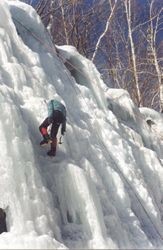 On the right, ice climbers work their way up frozen Roaring Brook Falls. On the left, snowshoers trudge up Cascade Mountain. A few minutes down the road is the turnoff for the Verizon Olympic Sports Complex, home to the world’s newest combined track for bobsled, luge and skeleton racing. Looming to the north is Whiteface Mountain, the site of some of the most challenging downhill skiing in the East. The road continues through the resort town of Lake Placid, host to the 1932 and 1980 Winter Olympics. A couple of curves later is Saranac Lake, home to the world renowned Ice Palace, which has become the symbol of the country’s oldest winter carnival. Perhaps the most well known area of the Adirondacks is Lake Placid. Originally established as one of the country’s first resort areas, families including the Vanderbilts and Rockefellers built lavish lodges deep in the forests over a hundred years ago. Today, the preserved wilderness, combined with the facilities left from hosting two Winter Olympics have turned the area into a winter playground second to none. A trip to Lake Placid is not complete without a visit to the Winter Olympic Museum, which is filled with video highlights, uniforms and equipment from the 1932 and 1980 Winter Games. Adjacent to the museum is the actual ice rink where the “Miracle on Ice” occurred. In their stunning 4-3 victory over the Soviet Union, the 1980 U.S. Ice Hockey Team accomplished what is generally considered one of the greatest moments of sports history. The upset came two days before their gold medal victory over Finland. 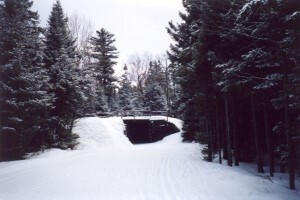 While in Lake Placid, you can visit some of the refurbished venues such as the ski jumping complex and even participate in activities such as bobsledding, cross country skiing, alpine skiing or ice skating on the speed skating oval. The best way to experience all of the activities is to purchase a Winter Passport. For a nominal fee, the pass includes (admittance to the MacKenzie-Intervale Ski Jumping Complex, admittance to the Winter Olympic Museum, Three sessions for Skating on the Sheffield Speed Skating Oval, a Cross Country Skiing Day Pass at the Mt. Van Hoevenberg Ski Center and a 1/2 Mile Bobsled Ride at the Mt. Van Hoevenberg Sports Complex). At the Ski Jump Complex, visitors can ride a ski lift alongside the jumping hills and then continue the journey on a 26-story elevator to the top of the K120 tower. The top offers spectacular views of Lake Placid and the surrounding mountains including Mr. Van Hoevenberg, Mt. Marcy and Whiteface. Mt. Van Hoevenberg is the home of the Verizon Sports Complex. It boasts 31 miles of cross country ski trails for all skill levels. 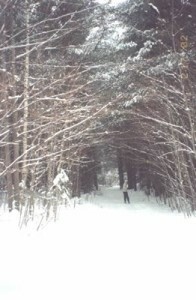 The well groomed trails wind through a beautiful evergreen pine forest covered with freshly fallen snow. The complex is also home to the world’s newest and fastest mile long combined bobsled, luge and skeleton track where visitors can watch future olympians train. 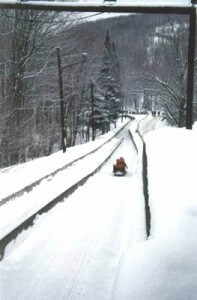 And best of all, it includes the original 1932/1980 Olympic bobsled track where daring guests can take the 1/2 mile ride with a professional driver and brakeman. This is not a sport for the faint-hearted. Careening down a steep and curvy iced track at 60 miles an hour can cause quite the adrenaline rush. With each curve, the rider’s head will bob back and forth, as they see only the sides of the track whiz by. Then as the sled races through the appropriately named Zig Zag turns, the riders will feel up to five times their own body weight. Experiencing the famous Zig Zag is something no one should miss. Located only minutes from Lake Placid and the neighboring Olympic sites, Saranac Lake is in the heart of Adirondack Mountain State Park. Six million acres of backcountry places this amongst the largest of parks in the United States. Voted one of the best small towns in America, Saranac Lake is built on a nearly continuous waterway which traverses a series of beautiful lakes from the top of Upper Saranac Lake to Lake Flower, several narrow channels and two locks. In addition to the waterway, there are more than a hundred miles of pristine groomed trails, making this friendly town where everyone seems to know one another, a snowmobiling paradise. Dominating the skyline is the Hotel Saranac. The 88 room hotel has been owned and operated by Paul Smith’s College since 1961. The hotel has served as a learning facility teaching hospitality management, culinary arts, baking and tourism. Approximately 60 students work side by side with professional staff to ensure quality service. While being reminiscent of an elegant European hotel from a past era, it is the Adirondack flare that gives Hotel Saranac such character. Although the hotel maintains its small town charm, it is not lacking in any amenities. Some of the amenities include A.P. Smith’s Restaurant for fine dining, Lydia’s Cafe & Bistro, the Boathouse Tavern, Paul Smith’s Gift Shop and a bakery filled with the students’ latest confections. In a town that is famous for its winter activities, there is no question that one of those activities would include skiing. There are two downhill ski centers nearby including the renowned Whiteface Mountain, which has the steepest vertical drop in the East. However, Saranac Lake is particularly known for nordic or cross country skiing. Skiers can tour the Jackrabbit Trail which is a 44 mile wilderness trail that stretches from Keene to Saranac Lake, with a new section running between Paul Smiths and Lake Clear Junction. It can be accessed from a number of different locations, enabling skiers to travel any length they like and enjoy the sections that are appropriate to their level of ability. Along the way, the trail connects five cross country ski centers and numerous trailside inns where skiers can stop to sample a delicious home-cooked meal or rest their heads for the evening. One place not far off the trail is the Harbor Hill Inn. Located on the shores of Lake Flower, Harbor Hill Inn is the perfect mountain getaway lodge. It is so peaceful, with only sounds of birdcalls and squirrels scampering around the trees, that it is hard to imagine that it is only a half mile from downtown Saranac Lake. Guest accommodations at the Inn are contained in a series of lodges and cottages. The largest is the Colden Lodge, a rustic wood building featuring 7 bedrooms, 4 bathrooms, a living room with a fireplace, two enclosed porches and two decks, one with a hot tub. Surrounding the Colden Lodge are 7 enchanting cottages all of which include kitchens, fireplaces and private decks with barbecue grills overlooking the lake, most also include hot tubs. All accomodations are exceedingly comfortable with antique filled guest rooms and rustic Adirondack charm. Still, nothing beats the hot tubs. After a long day of skiing, there is nothing like soaking in the glow of a million twinkling stars over the moonlit lake. In addition to the Jackrabbit Trail, impressive cross country skiing can be found at the Visitors Interpretive Center. The Center contains exhibits on the history of the Adirondacks as well as many public workshops. A delightful network of interconnected ski trails are open to the public free of charge. The trails run along hiking paths and offer gorgeous views of the nearby lakes and mountains. Perfect for beginner and intermediate skiers, the trails have some arduous climbs and fun downhill runs. One run on the Eskers Trail seemed especially long…perhaps half of a mile. For the most part, the trails are quite wide with a few exceptions where the trees seemed a bit close for comfort. Before hitting the ski trails, be sure to stop inside the Center where a dedicated staff of knowledgeable volunteers are always present to provide maps and answer any questions. Another Saranac Lake favorite is the Adirondack Motel which is run by the Muffin Man (Jerry Martin) and his wife Mrs. Muffin (Susan Martin). The hotel is located on the shore of Lake Flower which makes it a prime launching point for snowmobiles. It is also within sight of the Saranac Lake Winter Carnival Ice Palace. 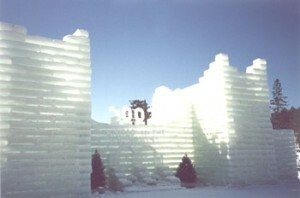 The Palace is built from hundreds of blocks of ice cut from the lake. The blocks are two feet wide and four feet long, and weigh between four and eight hundred pounds. The blocks are secured to one another with a mortar made of slush. It is truly a beautiful sight. Your room is quite cozy and well furnished. Amenities range from the simple motel unit to the fireplace suites with a full kitchen. The best part of staying at the Adirondack Motel is the complimentary continental breakfast. The aptly named Muffin Man bakes fresh muffins every morning. There is nothing like having a warm cranberry-chocolate chip muffin and a cup of coffee or hot chocolate on a cold winter morning. It’s the perfect way to start the day when enjoying the winter wonderland that is Saranac Lake. When it comes to winter activities, few places on earth can offer the variety found in the Adirondacks. 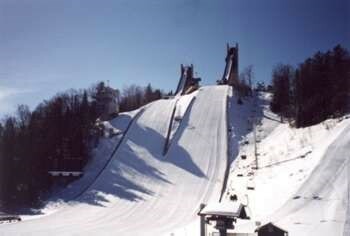 Where else can you ride to the top of a 120 meter ski jump or fly down an iced bobsled track at 60 mile per hour! Whether you are clomping across the snow on snowshoes, gliding across on skis or simply breathing in the balsamic air, the Adirondacks are truly a winter wonderland.